Match with It is also quite versatile when it comes to food pairing: it goes well not only with seafood and fish but also with delicate dishes made with wild fowl. It is especially recommended as an accompaniment to South Tyrolean Schlutzkrapfen. 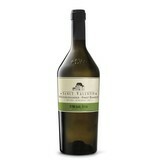 Pinot blanc has formed part of the premium Sanct Valentin line since 2001. Minimum yield from carefully selected vineyards speak to the fact that a lively, powerful top wine is pressed from the long underrated grape. Aged in wood, it is captivating as a result of its power and richness on the one hand, and because of its clarity and mineral finesse on the other. Its longevity is a compliment to its extraordinary quality. The 2015 Alto Adige Pinot Bianco Sanct Valentin is an inspiring wine. This expression of Pinot Bianco shows pedigree and persistence, with vibrant notes of stone fruit, honeydew melon and Golden Delicious apple. The wine is compact in terms of structure but long in terms of finish. You could pair it with grilled shrimp with a spicy marinade.